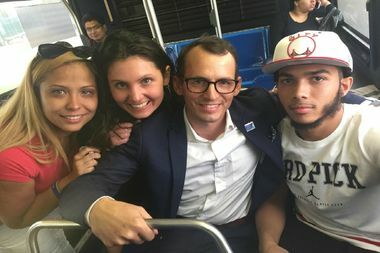 Pictured from left to right: Jessica Perez, Sierra Ewert, Wade H. McMullen Jr. and Pedro Hernandez, after he was released from Rikers Island on bail. "Incarceration at Rikers has been incredibly difficult for me, but it was my family who truly suffered. Being back with them is the greatest gift," Hernandez said in a statement posted on the Robert F. Kennedy Human Rights organization's website. His release came after a court appearance on Wednesday during which the rights organization offered to post Hernandez's bail and the Bronx District Attorney's Office agreed to lower the amount from $255,000 for two charges to $100,000. Hernandez's case has been likened to Kalief Browder, who committed suicide after being held awaiting trial for a stolen backpack, a crime he insisted he did not commit. Hernandez's release led to a call by Bronx Borough President Ruben Diaz Jr. for bail reform or money bail elimination. "There are too many more like me who are still inside Rikers just because they can't afford to pay bail. I hope my experience elevates their struggle and causes all of us to rethink how we treat those who are least able to purchase their freedom," Hernandez said. Jessica Perez, Hernandez's mother, had raised more than $100,000 for her son's bail through a crowdfunding site but later learned that the more than 3,000 donations would need to be vetted before the money could be accepted as bail, according to a message she has posted on the page. The Robert F. Kennedy organization stepped in, saying that "teenagers should not be locked up on Rikers Island solely because their families can't afford to pay bail," according to Wade McMullen, managing attorney for the human rights group. On the most recent case, he was initially accused of shooting into a crowd in 2015, but the District Attorney's Office now believes he provided the shooter with the gun. Numerous lawsuits have been filed against Terrell, including one in federal court by Nardoni's mother on his behalf. Hernandez's mother also filed suit on his behalf against Terrell and other officers from the 42nd precinct. It alleges a pattern of abuse and harassment that includes multiple false arrests preceding the one Hernandez was most recently jailed for. Hernandez's trial is expected to begin Sep. 6.